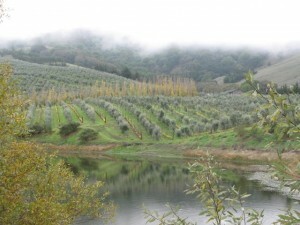 Although this year’s grape season had growers looking to the heavens for signs of blue skies, Sonoma Coast regional Tuscan olive farmers have been jumping for joy at bumper 2010 crops. 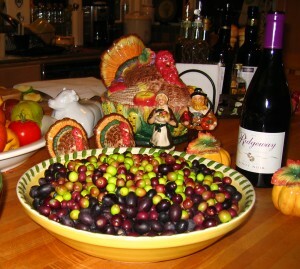 With such an abundance of local fruit, small-scale, backyard growers must make a reservation to participate in the November 14 or December 5th 2010 Community Milling Days over at McEvoy Ranch. Fruit must be healthy and leaf free. Syrah is the last of the Petaluma Gap grown cool climate grapes to hang on the vine and several vineyards in the area have been playing chicken with the rain and now frost, weighing in the benefits of boosting the brix a little higher before beating this rather sudden onset of wintry weather. Looks like we will be picking grapes one week and olives the next – an unusual scenario here on Rivetti mountain, but no doubt good for the biceps. Meanwhile, we’ve almost drained the last of our 2009 allotment from our friends and neighbors’ Teela and Mike Ridgeway’s family estate Custom Crush at McEvoys. The Ridgeways crush around 40 gallons later in the season, once the majority of their huge haul of fruit is black in color (see photo above). If you are looking for an exclusive olive oil produced in a limited quantity from premium fruit grown in West Petaluma, reserve yourself a dark green one gallon bottle from the Ridgeways for $75. per gallon. Southern Sonoma Country Life readers certainly love their local artisan edibles – email the Ridgeways for your limited edition olive oil stash to see you through winter holiday salads and through the year. Certainly one of the best kept secrets in town, though hot on the heels of one of Petaluma’s most beloved (Ridgeway Two Pisces) Pinot Noir – another great pick for the holiday table.